If you've got a flat battery, nothing gets your vehicle started more quickly or easily than a good jump starter. 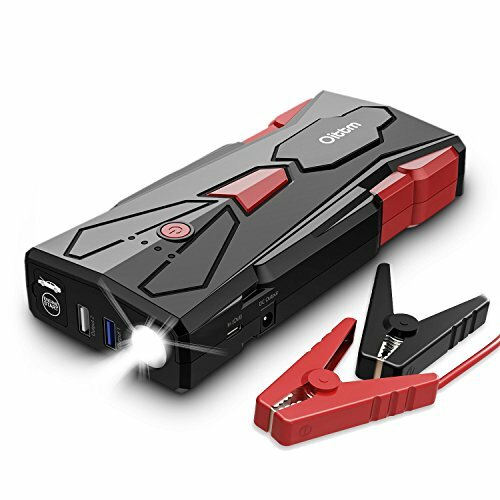 Ottim Jump Starter will jump start 8.0L gas or 6.5L diesel engine with ease. Clamping the corresponding polarity directly to the battery posts will give you the best results. The mistake-proof design makes it safe for anyone to use and features spark-proof technology, as well as reverse polarity protection. Three Light Modes - light up the dark! Well-constructed and compact size for easy storage in a glove box or large center console. 1.The jump starter will work best when its battery is fully charged. Please make sure the battery is more than 25% charged. 2.You can only start the car when the indicator light on the jumper clamps flashes green. 3.If you reversely connect the battery polarity, the LED indicator on the clamp will flash red, please disconnect the clamps and reconnect to the correct battery post. 4.Disconnect the clamps from the vehicle's battery if the engine is successfully started. 5.Allow the jump starter to cool down for at least 10 seconds after each jump-start. Powerful: 700 Instant Starting Amps/ 1500 Peak Battery Amps, for gas engines up to 8 Liters and diesel engines up to 6.5 Liters; start your engine up to 30 times on a fully single charge. Intelligent Safety Protection: Ultra-safe and mistake-proof design with reverse polarity protection of battery clamps, which allow it to safely connect to any battery. High-powered LED Light: 3 light modes (Strong Light/SOS/Strobe). Shines light wherever and whenever you need. Also works as an emergency light to call for help. USB 2.1A + USB Quick Charge 3.0: Provides wider compatibility and quicker charge to phones or tablets. Quick Charge 3.0 charges compatible devices up to 80% in approximately 35 minutes. Type-C + DC Output 12V/6A: + USB Type-C port acts as input and output, a reversible and high-power connection that recharges Type-C devices up to 5V 3A; plus DC output powers 12V devices.